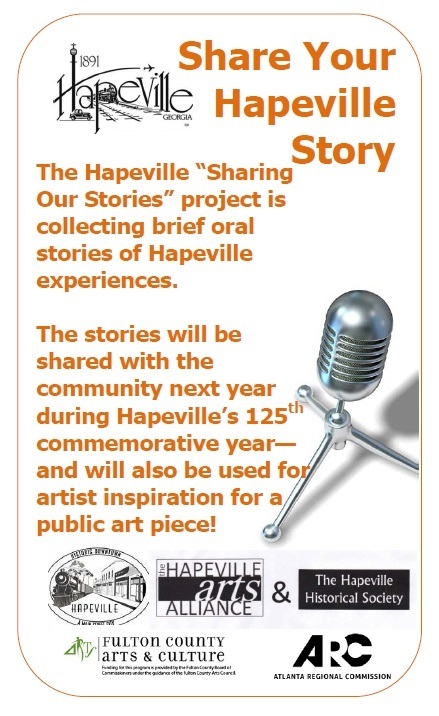 Visual artists are invited to submit proposals for Hapeville's “Sharing Our Stories” public art project. Scheduled for installation in the month July 2017, these works of visual art will be placed throughout Hapeville’s downtown arts district in celebration of the City’s 125th anniversary. Installations will be permanent and based on one or more oral histories that are available online. The works of art will celebrate the history of the community as a whole and the individual histories of its diverse residents past and present. The oral history files are divided into three folders: oral histories recorded in 1979; oral histories recorded in the community in 2015/2016; and video recordings of interviews with Senior adults and students at Hapeville Elementary recorded in 2016. Once installed, each artwork will include a QR code that will allow visitors to access an audio recording of the artist explaining the work along with the oral history that inspired it. Visual art installed for this project will become a part of a walking tour of public art in downtown Hapeville. This project is funded by the Atlanta Regional Commission and the Hapeville Main Street Program.
. Please include the subject line "Sharing Our Stories Question."